At the conclusion of SCANDALOUS LIES, Noah Sanders made a startling discovery, one that turned his already conflicted motives into further turmoil, the mystery of his past growing as dangerous as the undertow of the ocean. In Cane's Inlet, located on a barrier peninsula along the Jersey Shore, the lucrative summer season is fast-approaching, as is the Opening Night celebration of the Medusa Lounge, where Noah has secured a job. But working alongside the Hatcher's at their exclusive resort is complicated by his own investigation into the scandal that might connect them. With a family secret uncovered during a surreptitious visit to their mansion, Noah's quest to seek the truth behind his mother's deathbed confession takes on sudden credence. With the aid of his new lover, Demetri, as well as Cane's Inlet busybody Cilla Cane, the questions only deepen. 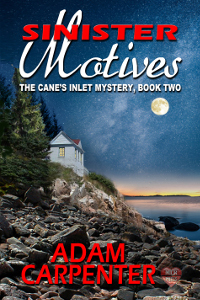 When another murder shocks the coastal village, Noah realizes that what's happening no longer concerns only himself, but perhaps all of Cane's Inlet. With a mystery dating back to the village's founding and the raising of the old pirate ship Medusa, no one is safe from being exposed, or from a desperate killer. For Noah, the truth might come at a price higher than he's willing to accept. SINISTER MOTIVES is the second part in a trilogy that will lay bare stories of the past, and in the end, no one will escape the web of deceit that has defined Cane's Inlet for more than one hundred years. Scandalous, sinister, suspicious, the Cane's Inlet Mystery is a tour-de-force tale of two families, one secret, and, ultimately, one man's discovery of his own true self.